Back on January 2nd we posted the details of the new TD Aeroplan cards that have been front and center in the news since last summer. 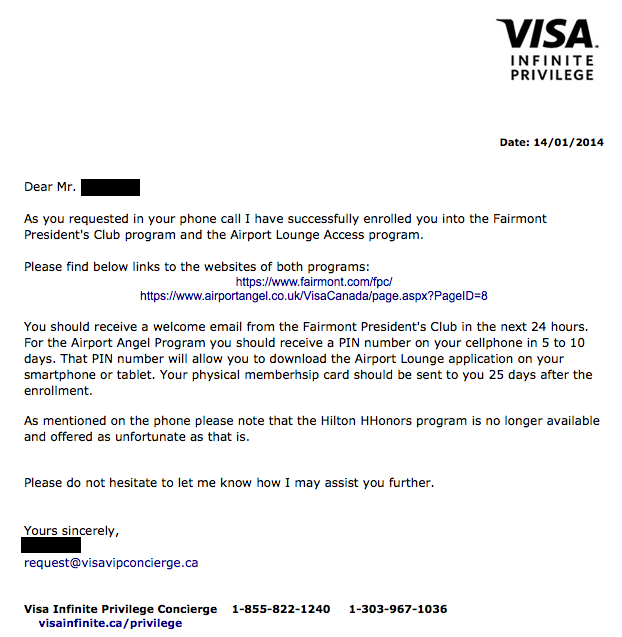 The high end premium version called the TD Aeroplan Visa Infinite Privilege was noted as being a great card with some drawbacks such as a high annual fee and a high income requirement. One of the key benefits we noted (that was somewhat hidden on TD's website) was a benefit extended from being an "Infinite Privilege" card and that was instant Diamond Elite status with Hilton HHonors. In fact we know of quite a few people who simply applied for the card for this benefit alone and unfortunately it has been pulled from the Infinite Privilege branding! Ultimately this is not TD's doing but Visa in general as all Infinite Privilege cards would be entitled to the benefits even though TD's is the first and only one of its kind in Canada. This is the first we have heard of someone having the fee waived on the TD Visa Infinite Privilege! Granted its not a waiver on signing up for the card as some people have been trying to get but have been unsuccessful. If you applied for this card with the Hilton Diamond status as one of your decision factors you should definitely be calling TD and asking for the same treatment! We know benefits of cards come and go but in many cases cardholders are given ample notice (ie. 30 days) but in this case it has been less than two weeks and the benefit was pulled without any notice at all! We can also let you know that the Visa Infinite page has now been updated as it no longer lists the Diamond status.